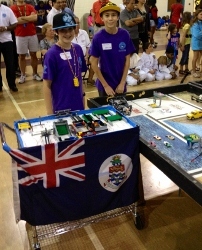 (CNS):The Cyber Rays, a team of five students from years 7& 8 at Cayman Prep came tops at the West Coast Florida Regional First Lego League (FLL) tournament in Tampa earlier this month and will now advance to the State Championship. The team was awarded the programming trophy for their innovative use of the Lego NXT programming language in their mission solutions. 32 teams competed in the one day tournament, with 10 gaining coveted invitations to advance to the Florida State Championship to be held February 26 at Florida Institute of Technology in Melbourne, FL. Now the Cayman team will be up against 50 teams from the FLL five regions in Florida as the stakes are raised in this robot contest. The Cyber Rays are Josh Martin, Ryan Kirkaldy, Nick Crawshaw, Mike Boucher and Drew Milgate. The coaches are Allison Smith (Teacher), David Kirkaldy and Jeff Boucher. The event comprised 20 potential missions to complete within a 2.5 minute round and the highest score of three rounds was counted. The missions are intentionally set so no team can hope to have a perfect score, meaning decisions must be made on the viability of certain missions that are high scoring but inconsistent in execution versus lower scoring missions that can give a respectable score consistently. The theme of the FLL mission board changes every year. This year globally over 17,000 teams are competing in a 'Food Factor' challenge, with Florida alone having some 500 teams in sanctioned events. This involves using the robot to clear bacteria, reverse pollution, safely transport groceries, harvest of corn, and eliminate viruses to name but a few. Each has to be solved by the students only with only coaching by the adult mentors. The team uses the Lego NXT-G programming language and only official Lego parts and sensors, typically from the Mindstorms and Technic Lego systems. The team also has to research, prepare and present a project on the food safety theme. The Cyber Rays developed a solution to combat milk spoilage and impressed the judges with their innovative solution for a milk dispenser in a fridge door, along the lines of a water dispenser, but with a recyclable milk bottle and sensors to detect spoilage. They found researchers that are actually working on similar projects in the 'real world' and added those scientific papers to their bibliography and project handouts. The robot is judged in a technical session to review the process from start to final robot including lessons learned and changes to the programme. This technical session includes a three judge evaluation of the robot design and the attachments used to complete missions. The team presented a documented technical workbook with design method and prototype challenges, along with details of the programming code used in each mission. The team is also judged on its understanding of the FLL Core Values, with the key learning point being to always demonstrate 'Gracious Professionalism' and 'Cooperation'. The level of competition is extremely high and our children have proven that an inexperienced team from a small island can not only compete but excel,” said Janet Crawshaw, parent of Cyber Ray team member Nick. Robotics is now a part of the curriculum at Cayman Prep High School using the varied LEGO NXT programmable brick system and accessory sensors. "We started informally in September, 2010, as a club for the years 7-9," said Allison Smith, ICT teacher and now Cyber Ray coach. "In September, 2011, the school introduced robotics into the curriculum for all year 7 students." Principal, Sheila Purdom is an enthusiastic supporter of the robotics programme and says the aims to stay on the cutting edge of educational technology.